"You will love this everyday cabbage dish with a rich, creamy add-on. Hmmm, good! This is a tasty dish, quick to get on the table ready to eat. Serve immediately hot. You can substitute seasoned salt for the salt and ground black pepper, if desired." Melt butter in a large skillet over medium-high heat. Saute onion and bacon in hot butter until bacon is browned and crisped, 5 to 7 minutes. Stir cabbage into bacon mixture and season with salt and black pepper. Pour cream over cabbage mixture and stir; bring to a simmer, reduce heat to low, cover the skillet with a lid, and cook until cabbage is tender, 5 to 10 minutes. 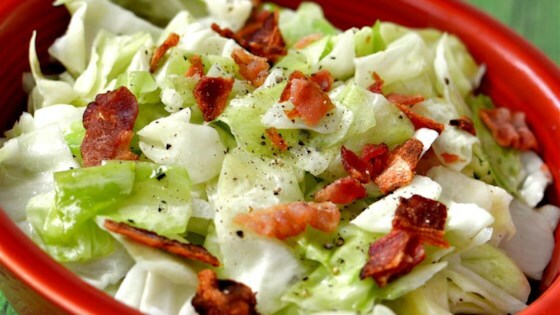 See how to make a flavorful cabbage and bacon side dish.